"Best Easter ham with horseradish which may surprise most, but that 'secret' ingredient is the key to its tangy taste!" Cut ham into 1/4-inch thick slices and tie slices back together in shape of original ham, using kitchen string. Place ham on a rack set in a roasting pan. Stir honey and cloves together in a bowl and drizzle honey mixture over ham. Bake ham in the preheated oven for 1 hour and 15 minutes, basting often with pan drippings. Mix brown sugar, horseradish, and lemon juice together in a bowl. Baste ham with horseradish glaze, allowing glaze to drip between slices. Continue baking until glaze has set, ham has browned, and an instant-read meat thermometer inserted into the center of the sliced ham reads at least 140 degrees F (60 degrees C), 25 to 30 more minutes. See how to make Chef John's honey-glazed ham for the holidays. Loved the tangy horseradish in this. I used a kurabota ham from Snake River Farms...so tender and delicious! 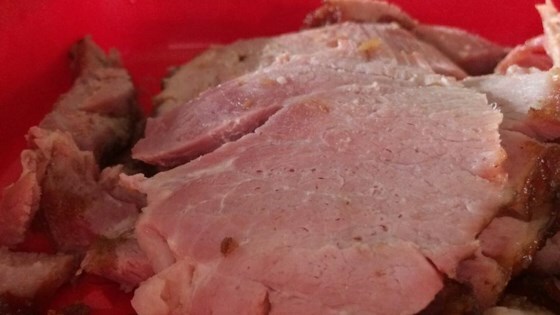 At first, I was starting to doubt this recipe but when the ham was complete, I was pleasantly surprised! It’s not to sweet and not a whole lot of spice. It was also good even for leftovers.